The sun always shines on the righteous, so it is said. Well, not sure about that, but the sun really did shine on this year’s annual Masonic charity fundraising week’s holiday organised by the Wigan Group. It was a cold and frosty morning when just short of 200 people arrived from their pick-up point or gathered on the car park at Bryn Masonic Hall to fill the four coaches organised for the Wigan Group by Assistant Provincial Grand Master David Ogden of Bryn Lodge No 6553. 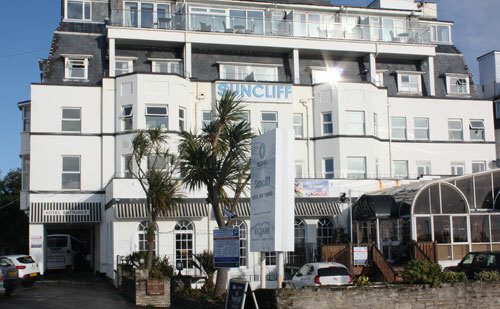 Cases were loaded for the journey to the Sutcliff Hotel, Bournemouth, for a four-night break. Brethren, wives and partners, not just from the Wigan Group, but parties from South East, Ormskirk, Bootle, Warrington and other groups as well, were all set for a great time, despite the cold start and frightening weather approaching from the west. Notwithstanding the early delays on the M6, the journey south was pleasant, with clear skies, nice views and two stops en-route for refreshments and lunch. The group had taken over the hotel, which sat proudly on the east cliff of Bournemouth with beautiful views out to sea and the Isle of White in the distance. There was time for a walk on the prom, a dip in the pool, or a spa treat before dinner. The first evening was spent in the hotel with excellent entertainment and cuisine, with just a fundraising game of bingo. With a talented singer, a great time was had by all, before retiring to be ready for the next day’s outing. Ready for the sponsored walk, what a turnout! The day after, was the morning of the charity walk, which was only about four miles along a very scenic coastal path which hugged the coastline, passed the Boscombe pier and finished back in Bournemouth, again at the pier. There was a fantastic turn out for the walk, in unbelievably fine and sunny weather. Back home in West Lancs the weather had turned nasty, snow had fallen, both airports were closed, schools were shut and the roads were gridlocked. 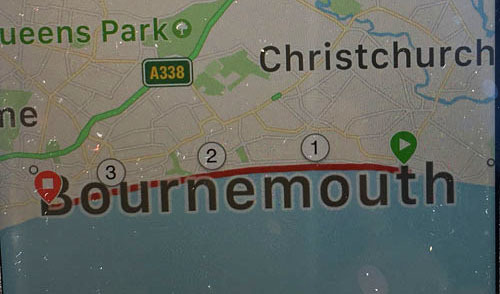 People couldn’t get to work, and down in Bournemouth fundraisers were bathed in sunshine. Th route of the sponsored walk. With a stop along the way for a hot drink and something a little stronger, everyone completed their goal. Star of the walk again this year was undoubtedly Sarah Brogan, who, without sight and with physical difficulties, pressed on determined to ensure the sponsorship for her effort. The party then spent the day in Bournemouth before returning for another great night’s entertainment and customary bingo fundraiser. Bright and early the next morning it was off to Weymouth, a lovely seaside town. It was dry, but the wind was blowing a gale. The surf was crashing on the beach and the temperature had plummeted. How fortunate the walkers were yesterday to have such fine conditions. Not to be put off, a great time was had by all and everyone, despite the elements, returned safely to enjoy the evening meal and entertainment. A fine dinner was followed by bingo, a raffle with two tables full of donated prizes and entertainment, only to be interrupted (if that’s the right word), for David Ogden to thank everyone and to bring them news of how the fundraising had gone. The trip raised a considerable amount of money. Firstly, the sponsored walk for the MCF 2021 Festival raised over £2000 credited to the various lodges and groups. On top of that, by some pretty canny negotiation, David Ogden and his team had managed to get discounts and other incentives to add to the funds raised by the raffles and games. As a result, a staggering amount of over £5,000 was raised, and, as is the custom on this holiday, was divided amongst the groups according to the numbers attending. Dividing the proceeds. Pictured from left to right, are: Pete Kelly, Ernest Lloyd, David Ogden, John Selley and David Whitmore. David was therefore delighted to share out the money raised with cheques presented as follows, to: Dave Whitmore of the Warrington Group for £670, Ernest Lloyd of the South Eastern Group for £860, Peter Kelly of the Ormskirk and Bootle Group for £1,005 and John Selley of the Wigan Group for £2,680. Tony Bent then thanked David and Joan Ogden, his drivers and staff, who had all worked so hard to make the event a success. Snow had fallen during the evening and night, again causing widespread disruption in the south west, but just like the weather for the sponsored walk, mother nature was kind to the holiday fundraisers, allowing a safe return home after a very enjoyable week’s holiday, with the warm feeling that helping to contribute over £7,000 to charitable causes brings.